Astronomers used the NASA/ESA Hubble Space Telescope to unmask the dim, star-starved dwarf galaxy Leo IV. Image released July 10, 2012. The Hubble Space Telescope has captured images of three odd galaxies that may help scientists solve a 13 billion-year cosmic mystery. The galaxies are so old and faint that astronomers nicknamed them "ghost galaxies" in a description. The objects are among the smallest and faintest galaxies near our own Milky Way galaxy, researchers said. "These galaxies are fossils of the early universe: they have barely changed for 13 billion years," scientists explained in a July 10 announcement. "The discovery could help explain the so-called 'missing satellite' problem, where only a handful of satellite galaxies have been found around the Milky Way, against the thousands that are predicted by theories." Dwarf galaxy Leo IV is hard to spot (left). A close-up view of the background galaxies within the box is shown in the middle image. The image at right shows only the stars in Leo IV. Image released July 10, 2012. "These galaxies are all ancient and they’re all the same age, so you know something came down like a guillotine and turned off the star formation at the same time in these galaxies," said study leader Tom Brown of the Space Telescope Science Institute in Baltimore, Md. "The most likely explanation is a process called reionization." In the history of the universe, the reionization period marks a time when the cosmos transformed from being filled with cool neutral hydrogen (which carried no charge) into a universe with ionized hydrogen that had been split into its component electrons and protons. That change made the hydrogen fog of the early universe transparent to ultraviolet light. The wide image shows dwarf galaxy Leo IV and the surrounding neighbourhood. The dotted line marks the galaxy’s boundaries, measuring about 1100 light-years wide. The small white box outlines the Hubble Space Telescope’s view. Image released July 10, 2012. The universe was filled with the neutral hydrogen about 300,000 years after the Big Bang, with the reionization period occurring sometime in the 1 billion years that followed, astronomers have said. Scientists suspect that radiation from the first stars and galaxies caused the reionization. In the new study, Brown and his colleagues found that the same radiation that triggered the reionization of the universe may have also stunted star formation in dwarf galaxies such as those spotted in the new Hubble telescope views. The team is actually studying Hubble observations of six faint dwarf galaxies, but only completed its analysis of the Hercules, Leo IV and Ursa Major objects. 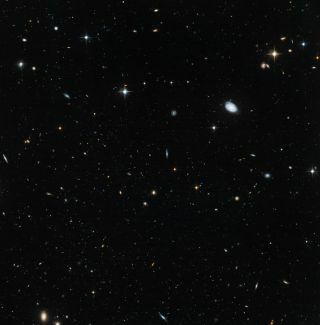 The Hubble observations are follow-up looks at data from the Sloan Digital Sky Survey, which identified about a dozen of the ultra-faint galaxies. The three galaxies observed in Brown's study are irregular objects that coalesced about 100 million years before reionization began. They are only 2,000 light-years wide, smaller than the dwarf galaxies seen today near the Milky Way. They are all between 330,000 and 490,000 light-years from Earth. The process of reionization may have stripped the galactic dwarfs of the vital gas required to build more stars and grow into larger galaxies, the researchers said. With little active star formation, such dwarf galaxies could be all but invisible to astronomers trying to understand why so few of the objects have been found, when theories predict that thousands should be visible, they added. There is one more oddity about the faint ancient dwarf galaxies. They appear to have 100 times as much dark matter as normal visible matter, the researchers said. That's substantially more dark matter than the younger, brighter dwarf galaxies seen near the Milky Way, which typically have about 10 times as much dark matter as normal matter, they added. "The small galaxies in our study are made up mostly of dark matter because their hydrogen gas was ionized and the stars got turned off," Brown said. The research is detailed in the July 1 edition of the Astrophysical Journal Letters. Brown and his team used the Advanced Camera for Surveys aboard Hubble to obtain the new dwarf galaxy views. The Hubble Space Telescope has been peering deep into the universe since its launch in 1990. The space observatory's mission overseen by NASA and the European Space Agency.